Housing Works is a donation-based book and thrift store whose entire proceeds support HIV/AIDS advocacy and services in addition to its own maintenance as a safe, open space. It is a spectacular space with high ceilings, endless shelves of books new and used, a mezzanine cafe and reading lounge, and an open back space with a stage (apparently the Black Keys performed there back in 2010, awesome). My friend Dave and I arrived promptly at 7:00 to find a smorgasbord of, as we were called by one of the publishing agents, “bespectacled feminists.” It’s true, we all wear trendy glasses. What’s your point? What happened next is the stuff of legends. I mustered up some courage (thanks Dave, and thanks Brooklyn Lager), marched over to Danielle herself, and introduced myself. I told her I admire and love her work (original, Staffaroni) and then gushed and gushed. But I think somewhere in there I decided to cool my jets, and we actually had a nice conversation. She is a smiling, laughing, TALL, adorable, and approachable human. This is exactly the person who would think of making Feminist Ryan Gosling flashcards for her friends to help trudge through feminist theory class. (Those were the origins of the project, she says.) In short, Danielle Henderson is a badass role model for all lovers of women’s & gender studies. 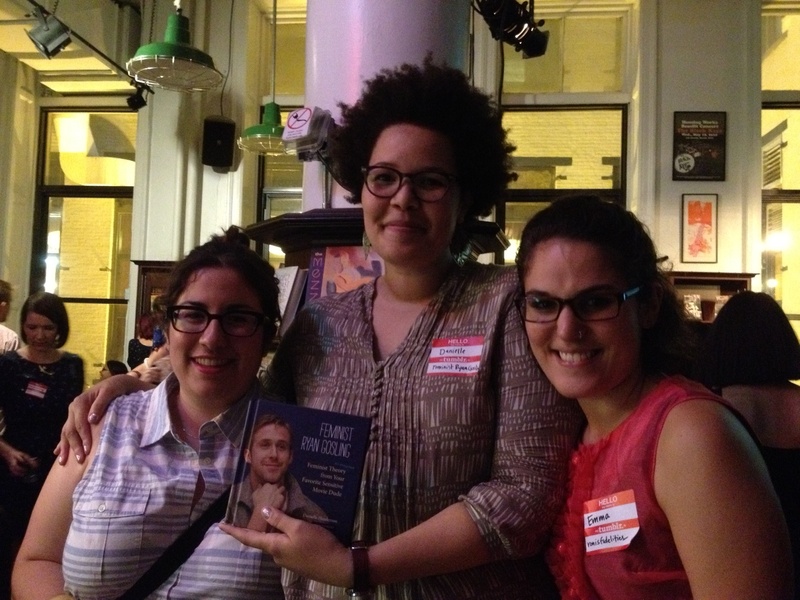 From right to left: Me, with vein of happiness popping out of my forehead; Danielle, creator of Feminist Ryan Gosling; and Elena (sp? ), her colleague in Wisconsin-Madison’s doctoral Gender Studies program. Danielle (I feel like I can use her first name now) also gave a short speech to the crowd, in which she confessed to having a lot of anger– “feminist rage.” The book was a way to laugh about feminism, to keep it light– but it could not replace the growing anger she feels as a scholar of women’s lives and issues. Getting into it about society’s double standards about women/men with opinions. Danielle speaks fluent pop culture AND fluent feminism; indeed, the two are inseparable. This was also an important breakthrough for me as a “feminist groupie.” Those of us who have come of age in the Third/Fourth Wave know that the internet is a vital mechanism for feminist consciousness and sisterhood. I cannot emphasize enough how important it is to support our sisters in feminist projects such as this one. 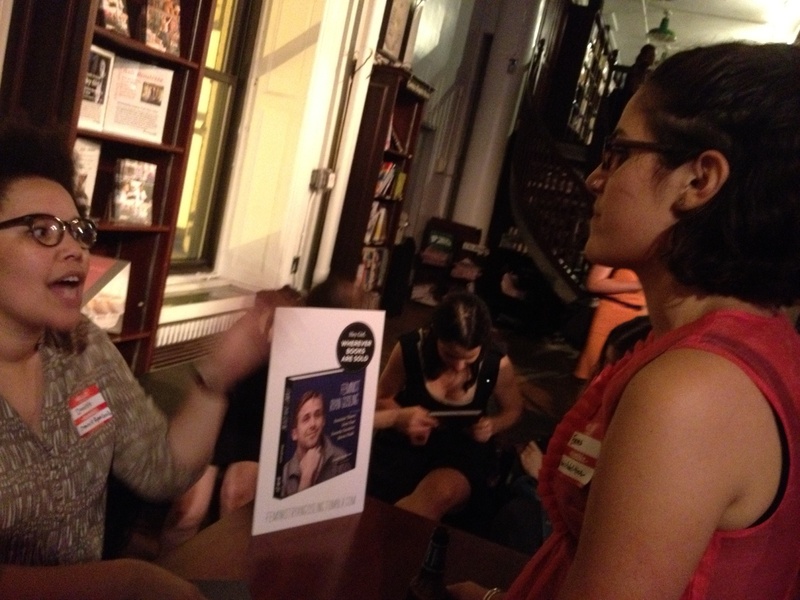 It may not seem like a big deal to show up at a book party. But by showing up, not only will your money/support land in the hands of folks whose missions and messages you trust and value– you also become, as I did, a part of it all, a member of this network. I was among friends last night; likeminded folks are out there! As I awkwardly said to Danielle: “I am one of you! You are one of me!” … I think she got my gist. All in all, it was an inspiring evening, validating the project of possessing and employing the feminist lens for all of life’s circumstances. Indeed, Ryan Gosling is just plain dreamy. 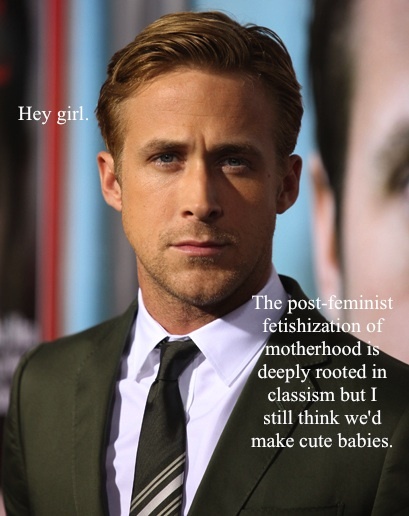 But I’d say he looks extra good in Feminist. 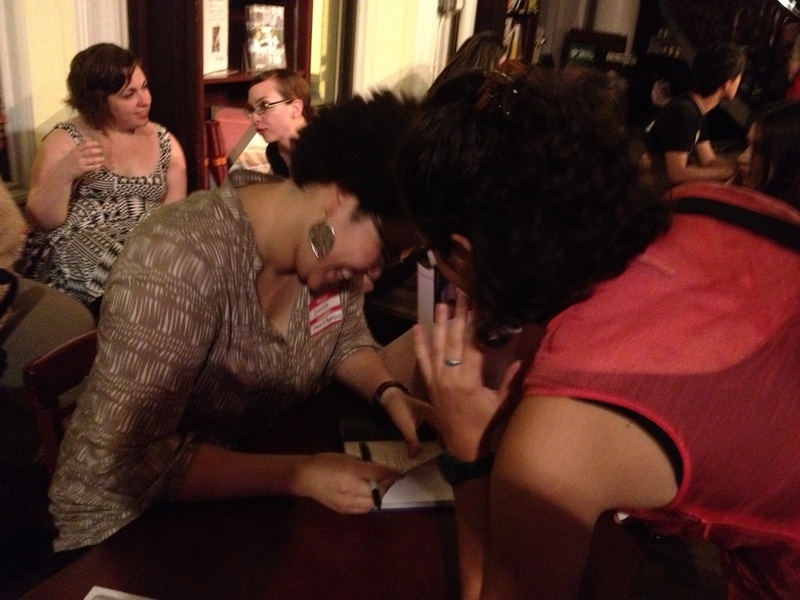 Danielle and I bond as she signs my book– “Sisterhood is strong!” she wrote.